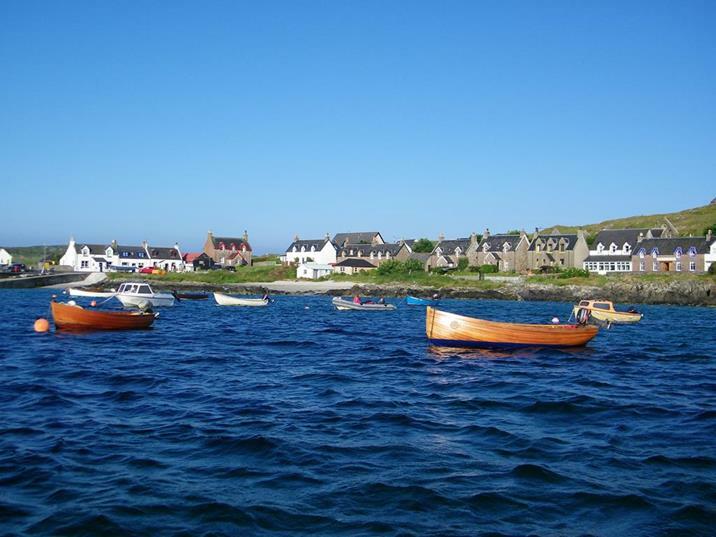 The Isle of Iona lies approximately 1.6 kilometres (1 mile) off the south west coast of the island of Mull. It is 1.6 kilometres (1 mile) wide and 5.6 kilometres (3 miles) long with a resident population of approximately 160. 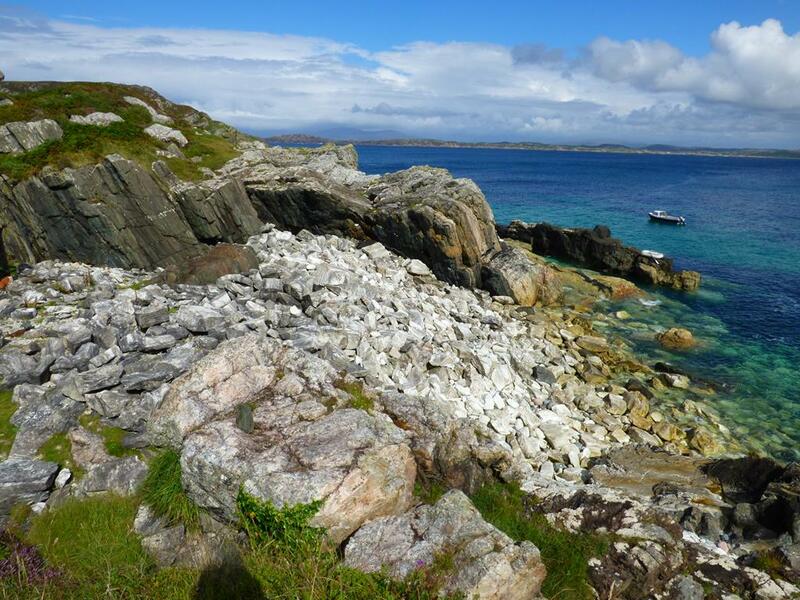 The geology of the island consists mainly of Precambrian Lewisian gneiss with Torridonian sedimentary rocks on the eastern side and small outcrops of pink granite on the eastern beaches and outcrop of Isle of Iona Marble and is very different to the rock structure and topography of Mull. Like other places swept by ocean breezes, there are few trees with most of these being located around the parish church area. 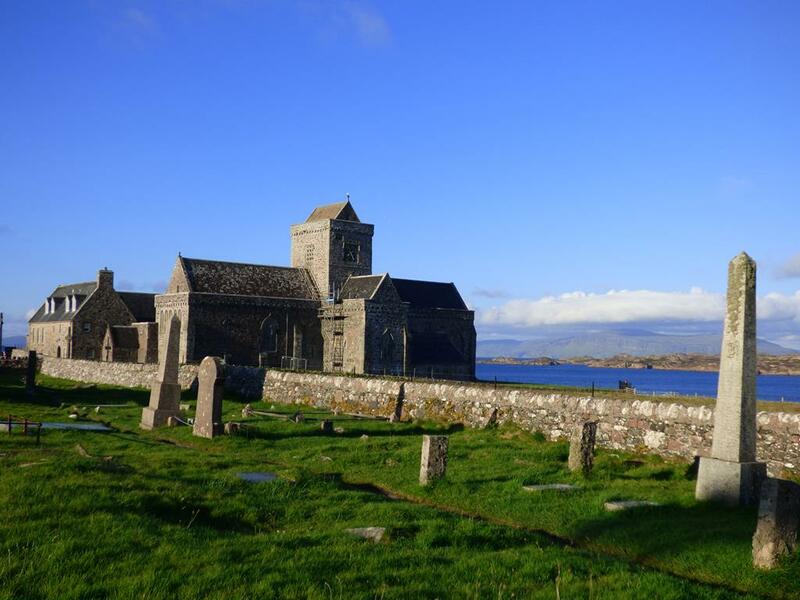 The name Iona is thought to derive from the Old Irish word for a yew tree, Eo, and although unproven, yew trees may have been here in earlier times. 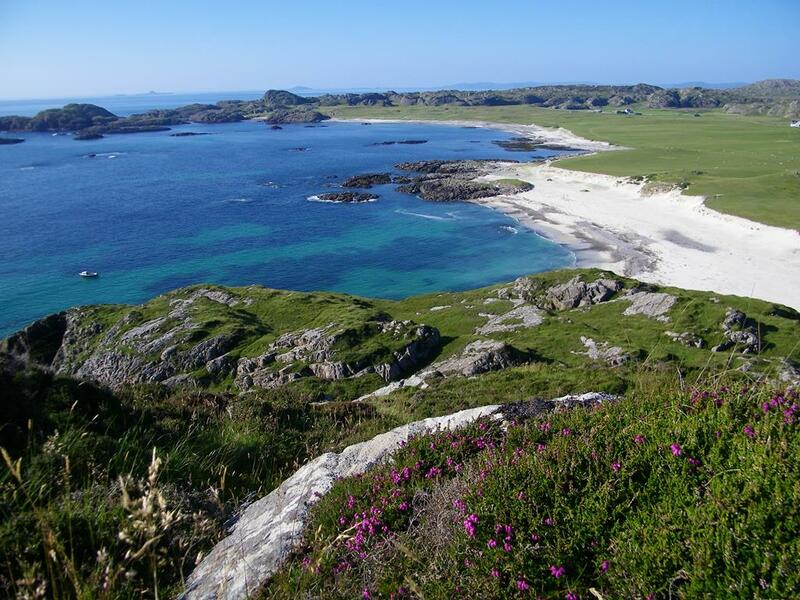 The Isle of Iona's highest point is Dùn Ì, (pronounced Dun E and means 'hill of Iona') is 101 metres (331 ft) above sea level, an Iron Age hill fort dating from 100 BC – 200 AD. The trek to the top is well worth the effort with fabulous panoramic views looking west out over many of the other Hebridean islands including Coll, Tiree, Lunga, Staffa and on a really good day Rhum, Eigg and Skye, to the south Jura , Islay and sometimes even North Antrim coast of Ireland. 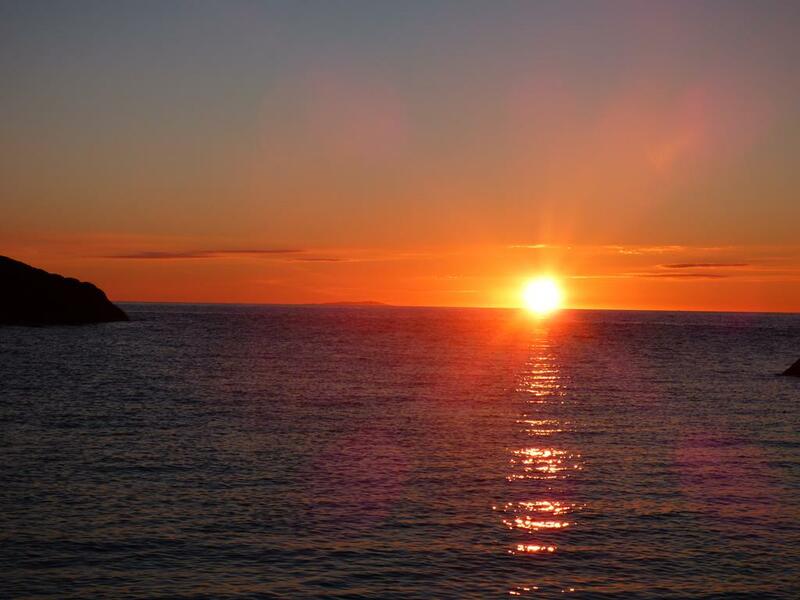 You will also find a cairn, trig point and the 'fountain of youth' at the top where legend has it it if you wash your face in its waters at sunrise you will remain eternally youthful. I have yet to be persuaded as it looks like a peat bog to me! 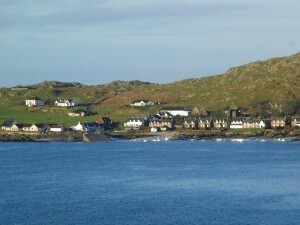 Its geographical features include the Bay at the Back of the Ocean and Càrn Cùl ri Éirinn (the Hill/Cairnof [turning the] Back to Ireland), said to be adjacent to the beach where St. Columba first landed.The main settlement, located at St. Ronan's Bay on the eastern side of the island, is called Baile Mòr and is also known locally as "The Village". 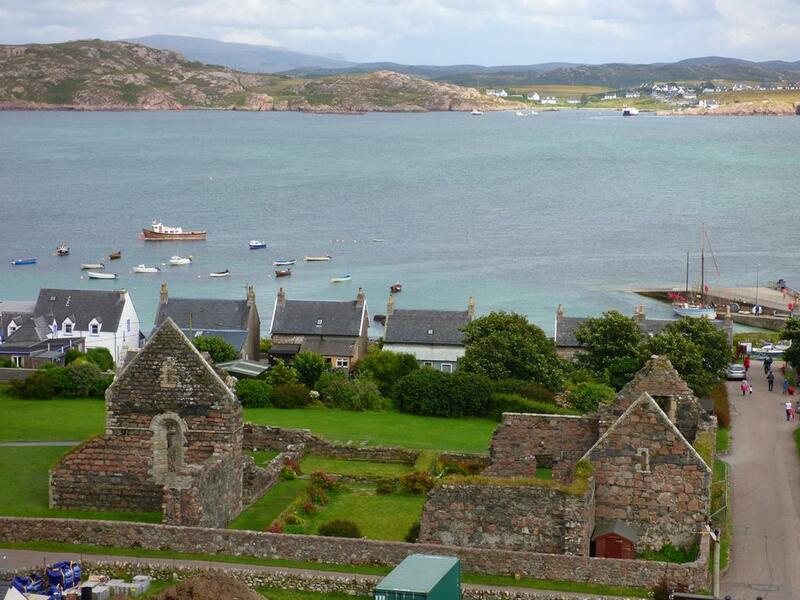 The primary school, post office, the island's two hotels, the Bishop'sHouse and the ruins of the Nunnery are here. 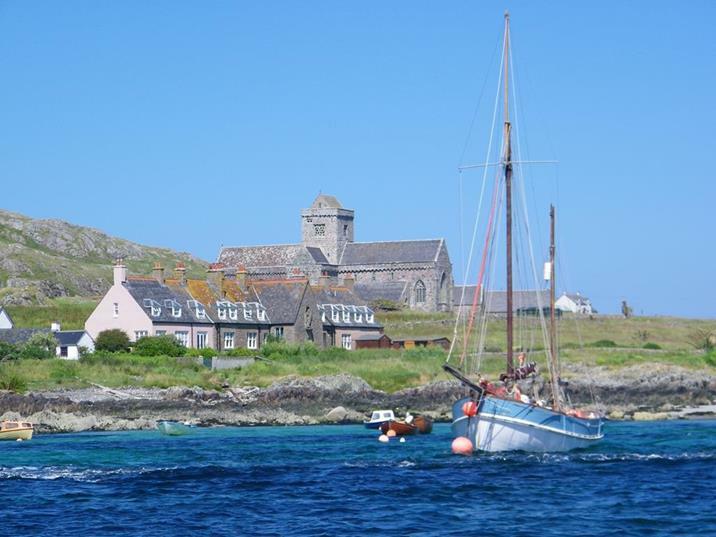 The Isle of Iona Abbey and MacLeod Centre are a short walk to the north and on your way opposite the Columba Hotel you will find the Columba Steadings, home to a number of local artisan and craft shops. Port Bàn (white port) beach on the west side of the island is home to the Isle of Iona Beach Party. 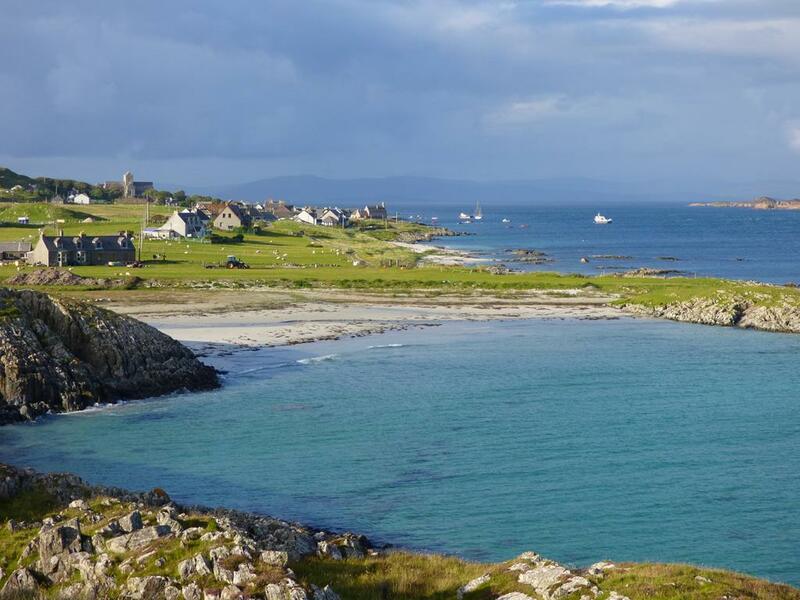 The Isle of Iona, being small, means that it’s economic resources are limited; however, with good fertile soil in parts and unlimited riches of the sea, a reasonable living can be made. 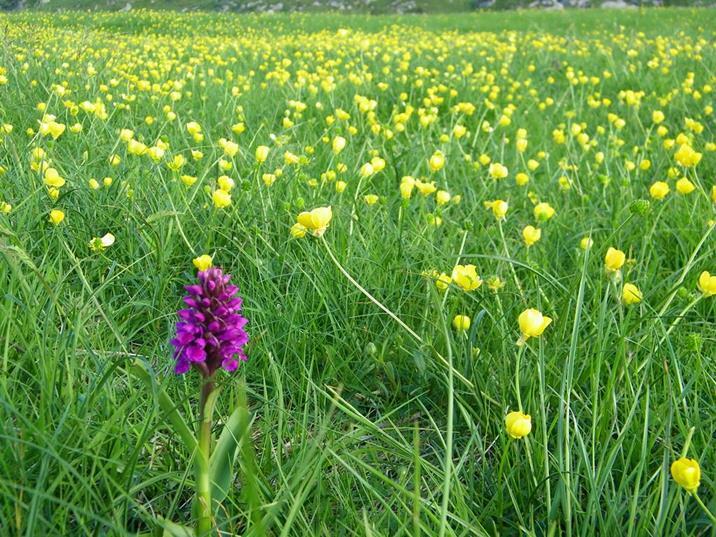 Crops are grown, animals grazed and the sea provides fish and shellfish. Much of the island's economy is now supported by tourism with day visitors to the Abbey as well as visitors staying on the island. 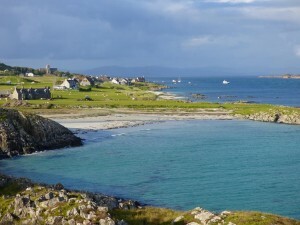 There are numerous offshore islets and skerries of which Eilean Annraidh (island of storm) and Eilean Chalbha(calf island) to the north, Rèidh Eilean and Stac MhicMhurchaidh to the west and Eilean Mùsimul (mouse island) and Soa Island to the south are amongst the largest. The steamer Cathcart Park carrying a cargo of salt from Runcorn to Wick ran aground on Soa on 15 April 1912, the crew of 11 escaping in two boats. 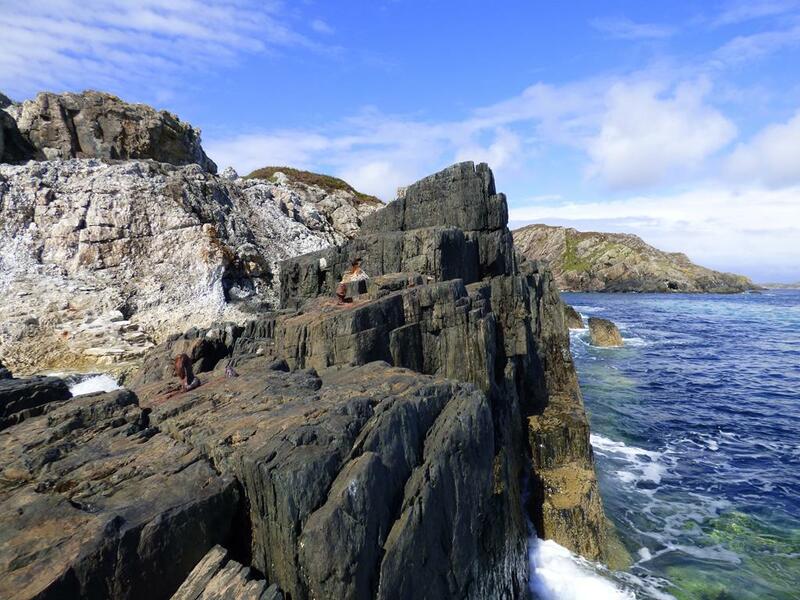 Soa is also the wee rocky island where John regularly fished for lobsters and on quiet sunny days often moore up on Soa to enjoy his packed lunches and take in some of the rays. 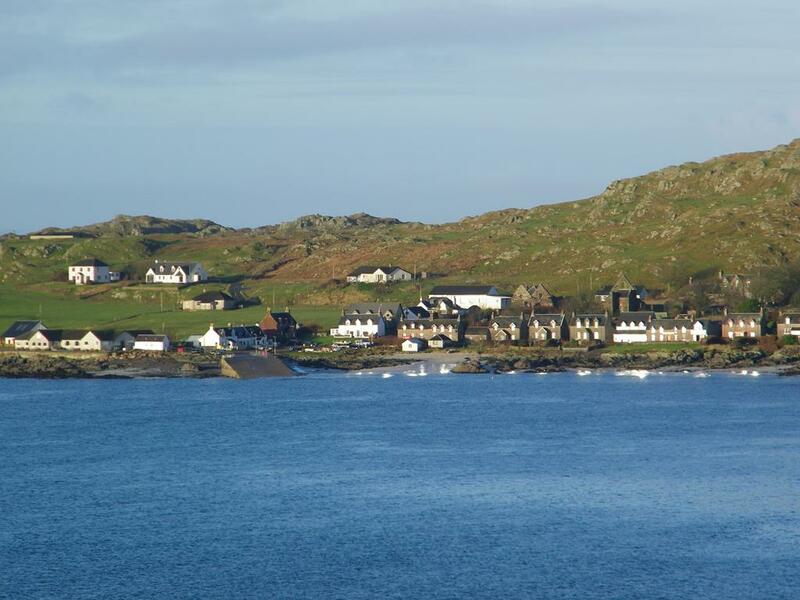 Access to the Isle of Iona is via the ferry point at Fionnphort and vehicles cannot be taken across to Iona unless you are a resident of the island or you have been issued with a permit by Argyll & Bute Council. 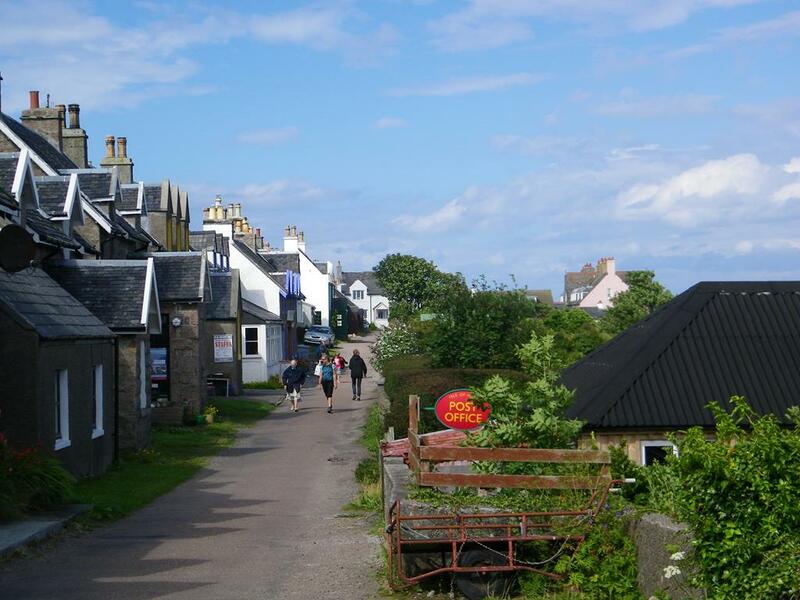 Tickets for foot passengers can be obtained from the small ticket office next to the ferry terminal waiting room or on the ferry if the ticket office is closed. 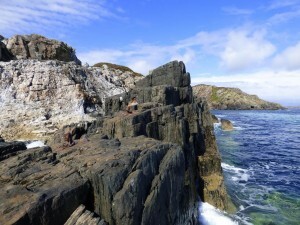 The Isle of Iona marble quarry is unique and in 1992 was made a Scheduled Ancient Monument. 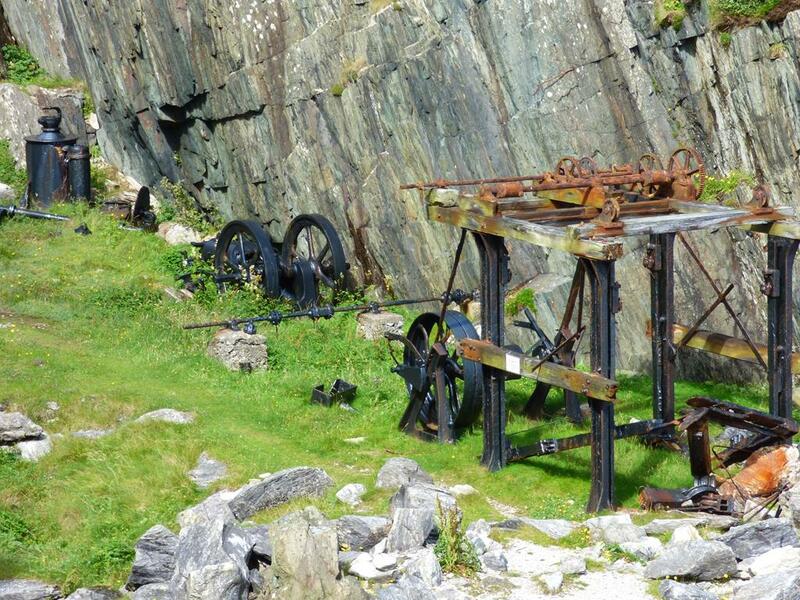 The quarry is of national importance because it is the only early 20th century quarry retaining original machinery. 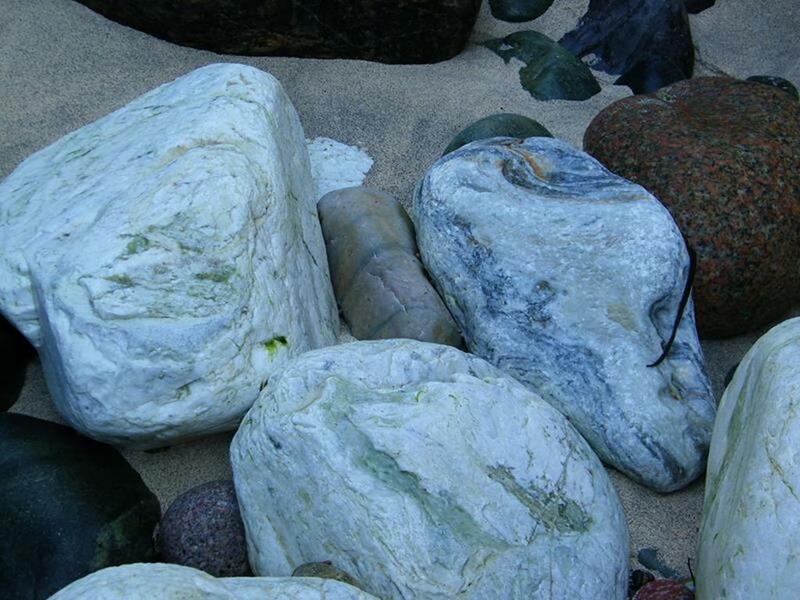 Also marble quarrying has been rare in Scotland The quarry was set in the ravine and each side of the ravine is marble and you can see evidence of the working on each side. The marble is white in colour streaked and mottled with yellow-green serpentine. 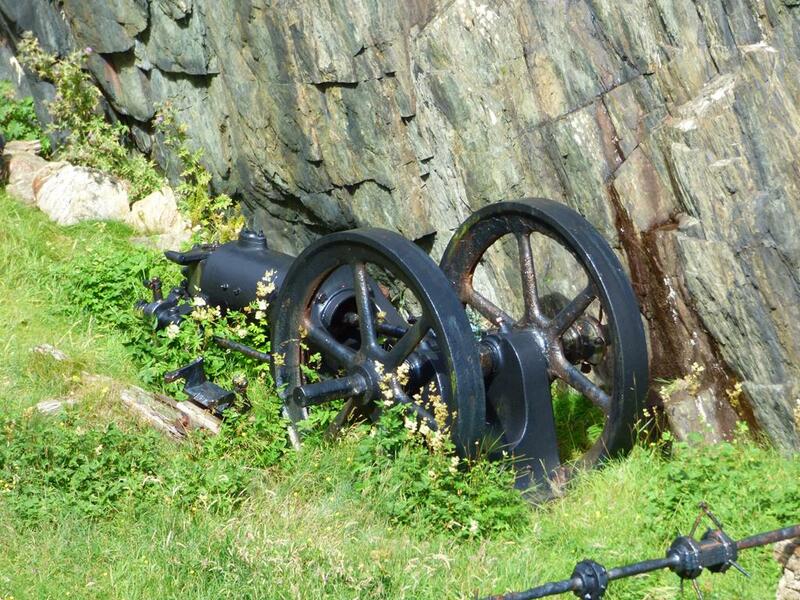 The outcrop was believed to be 7m wide by 100 meters long. The communion table and baptismal font in the Iona Abbey are both carved from Iona Marble quarried on the island. 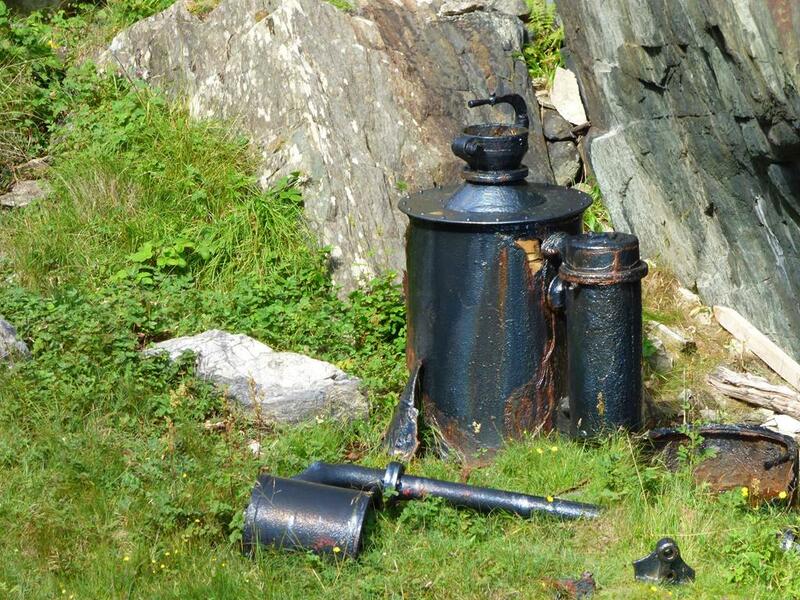 machinery was first installed about 1790 by the 5th Duke of Argyll, industrialist William Cadell and Swiss geologist Rudolf Raspe. 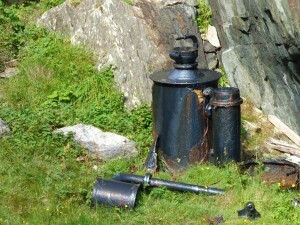 However it was un economical and closed a few years later. There was a failed enterprise by The Argyll Quarry Company in the 1800s, who tried to ship on an industrial scale but the remote rocky location proved too hazardous for shipping. It re opened in 1907 but was again closed in 1915. The Isle of Iona marble was transported around the world examples of which can be found in such places as St Andrews Chapel, WestminsterCathedral, London, a slab was sent to Johannesburg South Africa for a headstone for a son of the Duke of Argyll, Church of St Mary, Studley Royal, Yorkshire, Scots Kirk, Paris, St Andrews church Jerusalem, Albert Memorial,London, St Columba's church, Pont Street, London. Tiblisi Palestine and Adelaide, New South Wales.